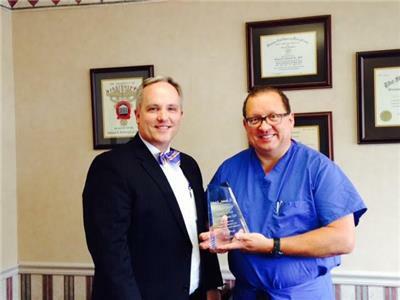 Pictured from left to right are: Jarrett Millsaps, CEO of Parkridge East Hospital; Dr. Del E. Ashcraft Jr., M.D., F.A.C.O.G. Dr. Del E. Ashcraft, Jr. M.D., F.A.C.O.G. completed his 1,000th robotic surgery at Parkridge East Hospital. “I am thankful for an experienced, supportive, and efficient team that allows an amazing opportunity for my patients,” Dr. Ashcraft states. Parkridge Health System’s Robotic Surgery program has flourished since its establishment at Parkridge Medical Center in 2002, with the installation of a da Vinci robotic surgical system, and its expansion to Parkridge East Hospital in 2008, with the founding of the Center for Robotic Surgery. The program has constantly strived to meet consumer needs and offer the latest advances in robotic surgery, including the da Vinci S High Definition robotic surgical system at Parkridge Medical Center and the da Vinci Si to Parkridge East Hospital. After observing its effectiveness in complicated cases, Dr. Ashcraft decided to undergo robotic surgery training, and completed his first robotic surgery on November 6, 2008. He observed that his robotic surgery patients’ experiences are very positive: they report less pain, have shorter hospital stays, and recover more quickly than patients than patients who receive non-robotic surgeries. These patients often say their robotic surgery was the “best thing I have ever done for myself,” Dr. Ashcraft notes. For more information about Parkridge Health System’s robotic surgery program, visit ParkridgeHealth.com.